It's that time again, for another book tag from Library Luv and I. I hope you all enjoy, you can see the original post, here. And like I mention EVERY SINGLE TIME, there are no rules! Except that you MUST either tag me or Library Luv on Twitter! Or comment below on either her blog or mine! 1- Top 5 favourite books you read this year? I have so so so so many wonderful books I've read this year! But here are my five! 2- What book best reminds you of the holidays? I would have to say . . . Harry Potter. Because in the book, their Christmas is the best Christmas. I wanna have Christmas at Hogwarts! 3- Two favorite quotes from books you've read this year? "Pity those who don't feel anything at all." - A Court Of Thorns And Roses by Sarah J. Maas. 4- One book you got/want for Christmas? 5- Two books that were released this year that you have yet to read? and, Fire Falling ... I was supposed to get it a month ago. But I didn't. I know, I know! I'm a horrible person who doesn't have a heart or soul! 6- 5 fictional characters you want at your new years party? 7- A book you read this year that you didn't like? If I stay . . . sorry If I stay lovers, I just couldn't get into it that well, but the idea was good. 8- A "Grinch-y" character you couldn't help but love? Now that I think of it, teague was a pretty Grinch-y character. And I was always sort of pro-Teague. Even though, if that thing happened I would totally be Team Jared . . . but then you realise like Mina did that they are--not telling. But Teague from Unenchanted. 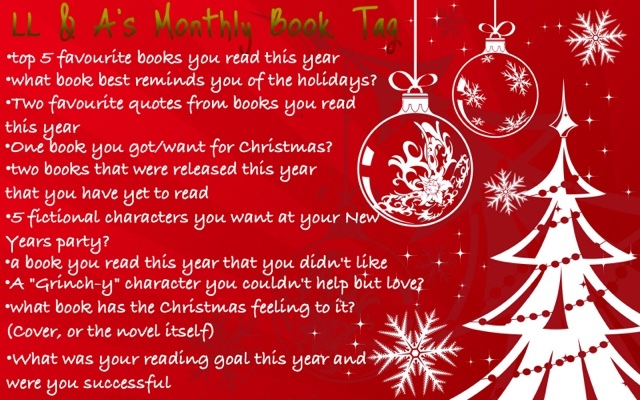 9- What book has that Christmas feeling to it? (cover or novel itself). Elemental's by Michelle Madowe . . . the cover is gorgeous AND, it has snow on it. 10- What was your reading goal this year and were you successful? I hope you enjoy and hope you do this tag! comment below or tag either of us on twitter! if you participate you will go on a list at the bottom of this post with your name + blog (or twitter). Only if you say it's okay to put you here . . . yup that's all folks, stay tuned to next time!